It takes me so long to post about the Flicker HA group fall card exchange. I love these exchanges as you get to connect with crafters from all over the world and make new friends. I love how his bright autumn card has turned out. It was safely delivered to Marijke in Holland. Is it a miracle or what? It took about a week to reach Holland! I am still expecting a card from my exchange partner. The background is made with distress inks and spritzed water on watercolor paper. Easy and fun way to create a custom-made background with in any color rage! I applied Glossy Accents on the flower, so it is masked and applied inks and stamping. 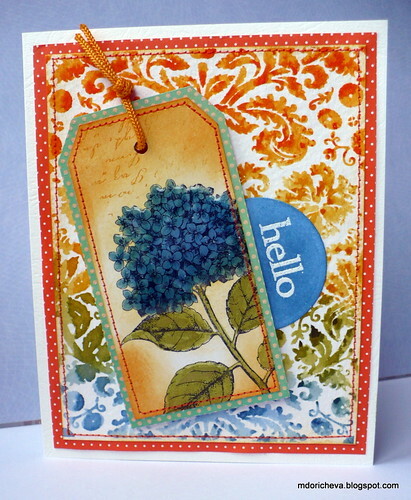 You made a truly gorgeous background for this tag Maria - that is a lovely stamp!